Worms are more than slimy fish bait. Their presence in our soil is crucial to the health and nutrient level of this growing medium. Lawn worm castings are the result of these organisms eating and processing detritus and organic debris. Worm mounds in yard and garden areas can be annoying and make holes in turf grass, however. In order to manage these piles of castings, it is important to answer the question, “What do worm casting mounds look like?” Once you are armed with a bit more information, you may decide that worm castings problems are worth living with when compared to the benefits they provide for your garden. What Do Worm Casting Mounds Look Like? If you have small, quarter sized piles of dirt in your yard or garden, you are lucky! 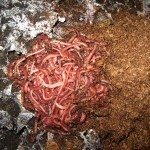 Worms eat organic garbage and excrete it out as nutrient rich castings. Their activities increase the tilth and overall health of your soil. The little domes of soil are proof you have a large populations of beneficial earthworms. Their tunneling activities aerate the soil and bring oxygen to plant roots. The tunnels also increase the percolation and water penetration of soil and sod. The nutrients in worm castings are important for plant growth. Worm mounds in yard areas are more of a problem than those in garden beds. Worm mounds in soil are just concentrated nutrients and cause no harm to most plants. Worm castings in lawn area, however, cause more of an issue. They make the turf lumpy and uneven, and the grass around the area yellows and dies. This is due to the extreme concentration of nutrients, which burn the grass. The gardener who desires perfect green grass will find lawn worm castings annoying but the benefit to the entire garden may outweigh the desire to eradicate the worm population. The little mounds may pose a tripping hazard and small dead spots in the lawn destroy the beauty of a well cared for grassy area. If these details send you over the edge and you need to kill the earthworm population, think twice! There are chemicals you can use to kill worms, but they generally kill other beneficial soil organisms too. You can use a heavy roller to smooth out the hills and then core aerate to decrease the compaction. Worm mounds in yard sites can also just be knocked over with a rake. Spread out the nutrient rich casting to benefit more of the sod area and prevent the concentrated burning. If you want to minimize worm activity on the surface of the soil, reduce watering. Moisture is attractive to the worms and they are busiest when soil is soggy. The best and easiest idea is to just sit back and enjoy the work of these wonderful organisms and the benefits they bring to the rest of your garden.